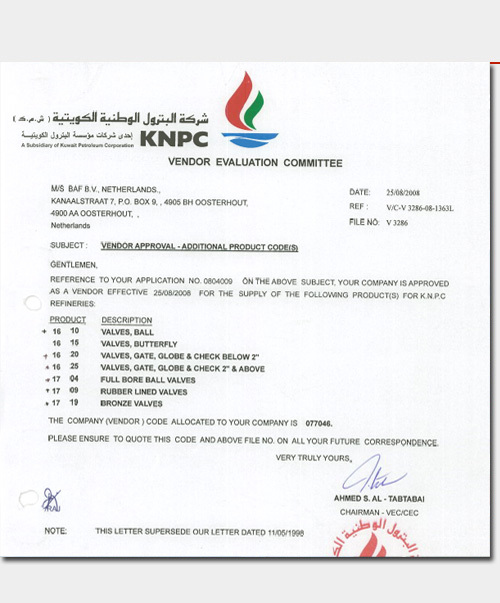 BAF Valves BV receives vendor approval confirmation of Kuwait National Petroleum Company. After an extensive evaluation and audit procedure, BAF Valves is honored and proud to confirm that receipt of the final acceptance and approval of KNPC Vendor Evaluation Committee (VEC) has been confirmed for a full scope of supply for ball-, gate-, globe, check and butterfly valves as well as an appraisal for the supply of bronze valves. The 100% subsidiary of BAF Valves BV facilitates HQ facilities with local after sales services. This branche office also offer workshop and service facilities for both BAF valves as well as reconditioning and repair services for all kinds of industrial valves. Also actuation and control services are being offered via this entity.